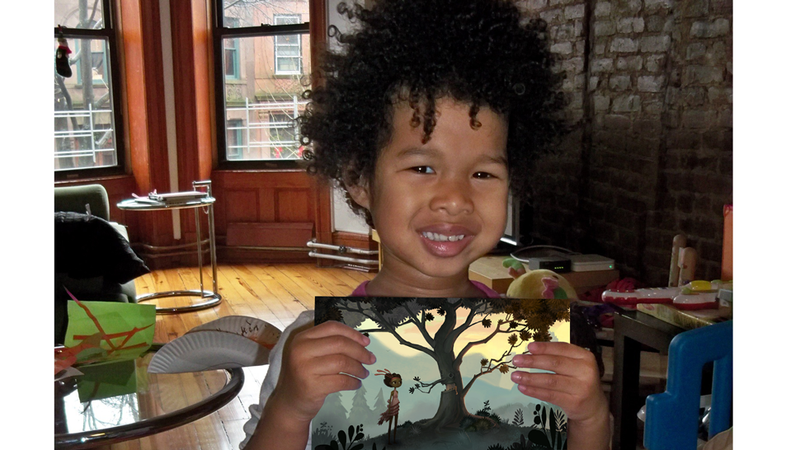 Broken Age almost made me violate one of my golden rules about kids and video games. I almost let my daughter watch me play it. Friends and family have asked my opinion on when to let little Jenny or Johnny start controlling virtual figures on a screen ever since I started writing about video games. There are a lot of variables about what both a parent and kid can handle but the one thing I've always been adamant about is that a kid should be a confident reader before they start diving into video games. If they start before they're able to read those on-screen hints and instructions, they'll be tugging on an adult's arm at an annoying rate, turning the experience into a chore. Cheeks can't read yet. But my daughter's at the point where she's making up little stories about the pictures, items and people she sees. Some of it is a parroting of the patterns she moves through during the day, only with the players transposed. "You're not sharing, Ballerina, so you have to leave our group and, when you come back, you say 'I'm sorry'," delivered in a squeaky-gruff 'adult voice.' The better material, though, is in the nonsensical imaginings, the stuff she knows doesn't make sense. She laughs when she's telling me that her teddy bear was waiting for me, laughs at expecting me to believe it and breaks down into a fit of giggles when I express my doubt or play along. Cheeks is starting to understand that the telling of a story—and the reactions of the audience—can be its own form of entertainment. Adventure games are full of Stuff That You Know Doesn't Make Sense and that was why I was tempted to sit her on my lap during my playthrough of Broken Age. She'd have a question about everything on the screen, I imagine, and would want to be the one to move and click the mouse around. Those hassles aside, I wondered at how her little brain would be mutating under the cosmic rays coming from her first deep video game experience. Like a lot of parents, I let her mess around on my iPad or iPhone sometimes. I've got a few apps on there that are specifically for her but it's always a bit of an experiment to see what icons are attractive enough for her to want to launch. Big faces are a draw for her so The Kid's big, sad eyes has prompted her to open up Bastion a few times. Same for the cartoony characters of Rolando. But she's really gravitated to Cut the Rope, probably something to do with the candy or the scissors in the icon art. (Most likely it's the scissors. She really likes to cut things.) Without any help from Daddy, she's cleared the first few levels of either the main game or the Christmas variant. (I can't remember which.) She calls Om Nom 'Froggy" and it's fascinating to watch her do trial and error and brute-force her way through the momentum-based gameplay. Broken Age would've been different, though. Right now, she likes to tell me the things she remembers from separate contexts and how they relate. "Daddy, you know what? Peter in [The Snowy Day] climbs a mountain just like [the mother rabbit in] The Runaway Bunny!" What would her brain have done with the 'take this thing from one place and give it to this person in another place' gameplay loop in Broken Age? Overall, most of the core actions of the game would be recognizable to her—walking, picking up stuff, talking to people—and aren't so bizarre that I would have needed to explain a lot to her. The possible combinations of actions and objects would probably excite her pattern-loving brain a lot. But, eager as I was, I know in my heart that my daughter isn't quite ready for the heady mix of stimuli that video games can provide. I need to follow my own advice and wait until she's reading on her own. Nevertheless, Broken Age is going on the list of games that I'm making in the back of my head that I want her to play eventually, because of its funny, poignant take on family dynamics and the way it dramatizes what it's like to go out into the world. It's probably going to be a harder wait for me than it will be for her.